Like many of students, Chris Dosen, a senior at Cherokee Trail High School, has been taking many advanced tests in the last few weeks leading up to graduation. However, among the tests Dosen took was a very special industry certification — one that only a handful of people in the world have passed: The Certified Solidworks Expert (CSWE) exam. SolidWorks is a 3D mechanical computer-aided design software used by engineers and designers worldwide. 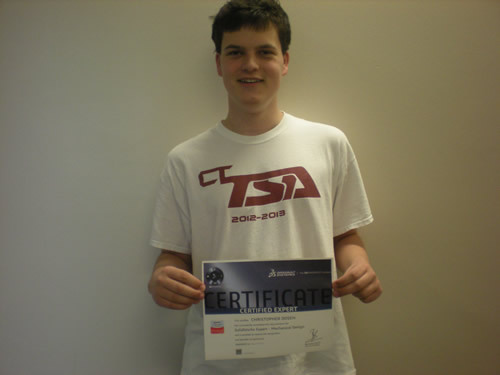 In order to be able to take the exam, Dosen had to pass five other certification exams first: Certified Solidworks Associate, Certified Solidworks Professional Core, Certified Solidworks Professional – Surfacing, Certified Solidworks Professional – Sheet Metal, and Certified Solidworks Professional – Weldments. And take it he did. In fact, he passed the exam with a perfect score. Next year, Chris will be attending California Institute of Technology (Caltech) in Pasadena, CA, where he will study mathematics. Congratulations Chris for your outstanding performance and good luck in college next year! Previous Previous post: State Conference registrations set new record!